I am sorry, but my Website is no longer active. I am so proud to be an American today. Now we need to hold our new "progressive" President and Congress accountable. We must keep working to remind them each day to work hard for the American people and do what is right to improve the future for our nation and our world. 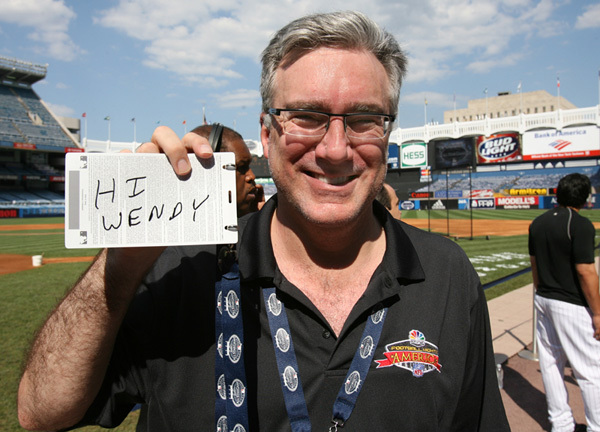 My favorite news commentator Kieth Olbermann holding up a sign for me at the 2008 All Star Game in Yankee Stadium - "Right Back At You Kieth!" *CommonSenseMom.com is a commercial entity that is NOT associated with any political action committee. Common Sense Mom designed products are intended to facilitate freedom of speech expressed by the wearer. FEC rules require that money from the sales of these products will NOT be used to finance a specific political campaign. Copyright © 2003-2005 Common Sense Mom. All rights reserved.